You should also try the interactive TurnTool scene. 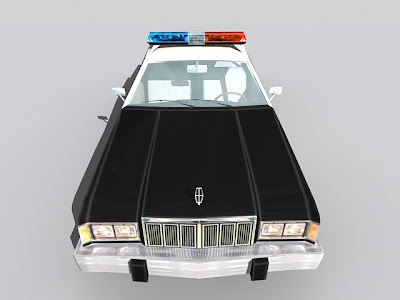 Final polygon count (tri's) is 3164 for the detective car and 3438 for the police car - including detachable hub caps and light decals. 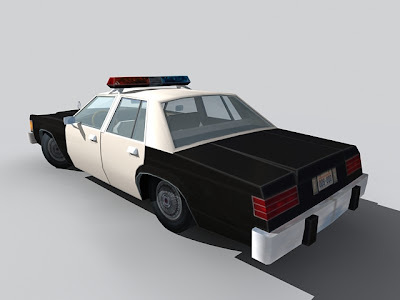 They each use 2 main textures sheets of 1024*1024 (in the turntool version) for the body and details, and 2 secondary sheets of 512*512 for transparent stuff like windows and decals, as well as a few smaller reflection maps. 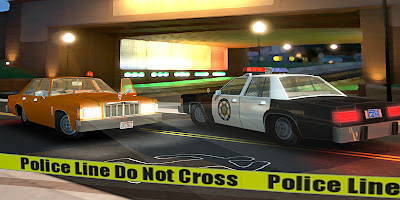 Some maps are shared between the two cars. Here's a current work in progress. 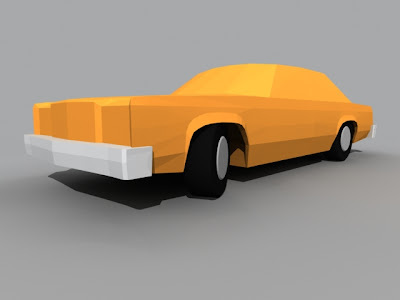 A low-poly Mercury Grand Marquis (approx. 1984). 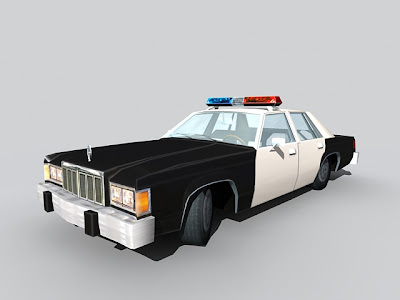 The plan is to do a traditional cop car, an undercover cop/agent car, and maybe a slammed gangsta ride, or pimp-mobile. I've only got a small straight-on side view drawing from an old ad, and misc. reference photos - no actual blueprints (if you happen to have some, I'd love to borrow them). 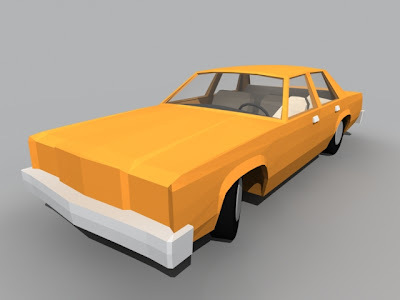 I've got the basic bodywork done, and currently I'm blocking out the interior. I'll add details and smoothing groups later. - I'd love to keep it around 4000 polys, and it should be doable. Currently it's about 3000, but obviously lots can be optimized. 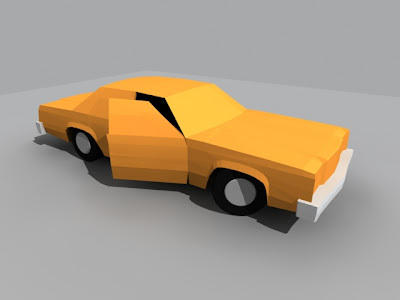 Added windows, interior (seats, dashboard, steering wheel), and handles (plus minor tweaks). Close to 4000 polys (tris) now, but it's still not optimized. 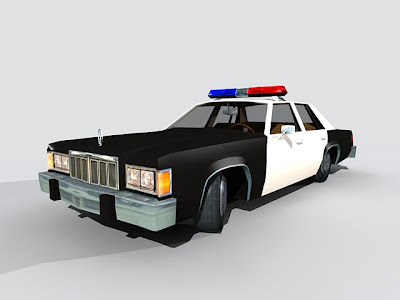 I'll add exterior details like mirrors and police lights next. 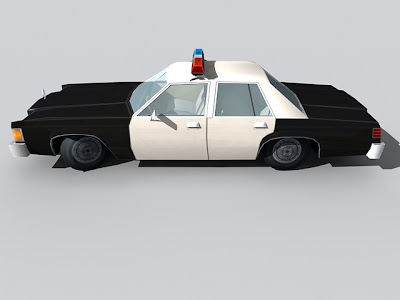 Added mirrors, police lights rubber bumber blocks. 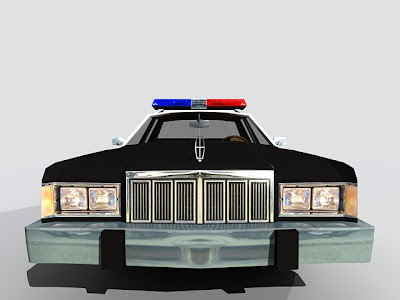 I also did a quick test to illustrate the two types of cop cars I'm after. 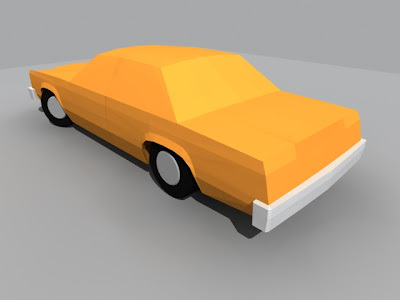 I've optimized, smoothed, unwrapped the car and I'm now in the middle of making textures. Polycount is now 3026 (tri's), so that's more than 25% cut-down from the 4200 polys it was in last update. I've don a bit more painting - not done yet though. More painting and some minor fixes to various smoothing groups. TurnTool file has also been updated. 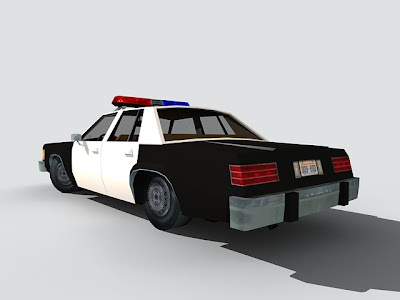 Ive added logos and license plates (yes I know the license plates say Washington, and the badge says Nevada - I'll change the license plate later). 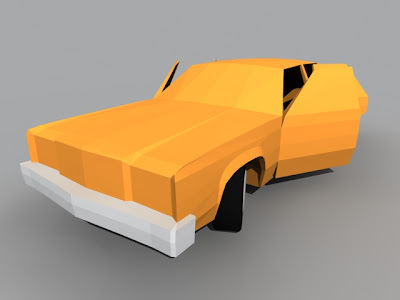 Based on user comments on 3dmaxer.dk, I've also modelled the flash bar and insides, making the transparency show, and I've added a grid between the front- and backseats. Finally there's some texture details added to the bottom, not that it's that important. Poly count is now approx. 3300. Still room for a gear shifter and more decals.